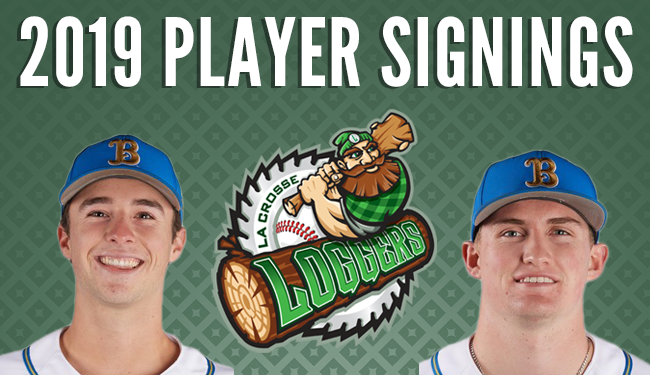 LA CROSSE, WIS. –The La Crosse Loggers Baseball Club announced Monday the addition of two infielders from the University of California-Los Angeles to the roster for the 2019 season. Freshmen JT Schwartz and Jack Filby will continue the long summer tradition of Bruins playing in La Crosse. JT Schwartz is a standout corner infielder that attended Corona Del Mar High School prior to joining the Bruins. The 6-foot-4 left-handed hitter projects to bring a combination of plate awareness and power to a Loggers’ club focused on discipline and pitch selection, as they set a franchise record in walks and on-base percentage a summer ago. Schwartz hit .373 with a 1.029 OPS, 13 HR, and 25 doubles over his four-year varsity career at Corona Del Mar. In his senior campaign, the southern California native belted seven HR and drove in 34 RBI, earning All-CIF Southern Section and first-team All-Pacific Coast League recognition. Schwartz also hit .320 with a .395 OBP and .955 OPS in 20 games for the Wenatchee AppleSox of the West Coast League last summer, collecting four HR and four doubles. Perfect Game ranks the high school shortstop as the No. 17 overall prospect in the state of California, as well as the No. 24 shortstop in the nation. Jack Filby is an infielder and right-handed pitcher that attended C.K. McClatchy High School in Sacramento, California. Filby hit .256 with a .352 OBP in 49 games with the Walla Walla Sweets of the West Coast League last summer, playing both middle infield positions and making five appearances on the mound with a 1.42 ERA. The left-handed hitter finished his senior season at C.K. McClatchy with a .373 batting average and 1.108 OPS, after hitting .427 and earning first-team All-Sacramento Bee in 2017. The versatile infielder is ranked as the No. 30 overall prospect and top third baseman in California, as well as the No. 13 third baseman in the nation by Perfect Game. Schwartz and Filby will look to make a strong contribution in their first season on a UCLA ballclub that ranks 5thin the 2019 D1Baseball Preseason Top 25. The Bruins are coming off of a 38-21 record and an appearance in the NCAA Regionals last spring, and expectations are high for 2019 after the Pac-12 powerhouse brought in the 4thranked recruiting class in the nation. The current UCLA roster is loaded with former Loggers including Jeremy Ydens (2017), Jake Hirabayashi (2016-17), and Jarron Silva (2018).